This is another recipe where I found a few variations and made it my own. So if there are flavors in here you don’t like please omit them. I'm not a big fan of tomatoes or mangoes and they were in different versions I saw. I don’t want to go all conspiracy theory on you but we don’t use canned vegetables because of the chemicals in the lining of the cans. You can read one of the studies here. We use fresh or frozen vegetables or in the case of beans and legumes we buy them dried and then cook them. It’s healthier and so much cheaper! It does take some pre-planning on your part. I usually let the beans soak in a giant bowl of water for at least 8 hours and then cook them on low in my crockpot (again in water) for 8 hours. I strain and rinse between each step. 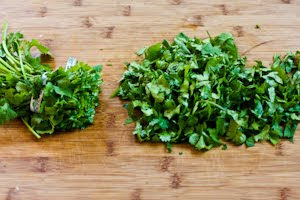 Cilantro is one of my favorites! Combine dressing ingredients and pour over beans in a large bowl with lid. Shake & let it marinate while you prepare the other items. 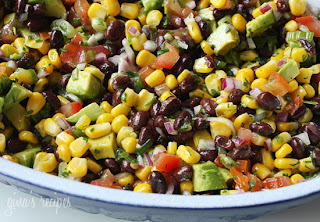 Chop the avocado, peppers and onions into small squares (about the size of the beans & corn). If your food processor or mandoline has attachments to do this without turns it into a mushy mess than you do that instead of a knife & cutting board. Chop cilantro. Pour into bean marinated mixture and stir/shake. It’s great as a salad or side, and also works well on a pita or scooped with tortilla chips. I love it for summertime and also tailgating!